So many people are visiting Sơn Đoòng Cave. It has therefore become important to make sure their walking around does not damage the special natural structures, called stalactites, which have taken hundreds of years to form. For that reason, it has been decided that special ladders should be placed in the cave. By climbing and walking on these ladders, visitors have less chance of damaging the stalactites than they would if they were touching them. 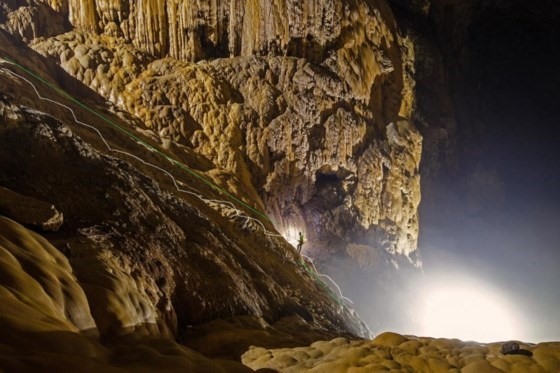 QUẢNG BÌNH — Authorities in central Quảng Bình Province has given their nod to the proposal to install a ladder system inside the world’s largest cave – Sơn Đoòng Cave. Oxalis, the sole tour provider for expedition programmes in the cave, and Howard Limbert, a cave expert in the team of the British Cave Research Association that discovered the cave, have proposed installing ladders inside the cave to protect the stalactites from visitors. According to the proposal, the ladders will help visitors overcome a high stalactite wall, called “Việt Nam’s Great Wall.” The wall is vulnerable to pressure and the ladders will help visitors climb it without touching the stalactites. The ladders are also expected to help speed up emergency medical aid for visitors who accidentally get injured inside the cave. In addition, the ladders will reduce the duration of time visitors spend inside the cave, which means less impact on the entire cave. The two ladders will be 65m and 25m in length. The 65m ladder will be installed permanently with nails hammed to the karst surface. Notably, this ladder requires 23 nails, of which, eight will be installed while 15 others were hammered by the British association’s explorers in 2010 during their exploration trip. The 25m ladder is a single ladder that does not require nails and is removable. Authorities of the Phong Nha-Kẻ Bàng National Park, the technical manager overseeing Sơn Đoòng as part of the world heritage group, passed the proposal as they determined it would cause no harm to the stalactites but could reduce impact on the grotto in general. The province People’s Committee did the same, giving the green light for the installation. However, this sparked a fresh controversy as netizens worried about the impact from the nails. Subsequently, the Department of Cultural Heritage has requested a detailed report on the installation. Trần Tiến Dũng, the committee’s deputy chairman, told local newspapers that environmental impact assessment is not necessary in this case as no construction would be done at the site, and the national park, the direct manager of the cave, has given its approval. Howard Limbert, an expert with 25 years’ experience in exploring Quảng Bình’s caves, including Sơn Đoòng, affirmed to local authorities and the media that the installation would not harm the grotto and would provide “a definite path” for visitors to follow, avoiding stepping on newly-formed stalactites. Authorities in central Quảng Bình Province has given their nod to the proposal to install a ladder system inside the world’s largest cave – Sơn Đoòng Cave. To be given a nod means to be told “yes, you may do something”. A proposal is an idea that is put forward to be decided upon. To install a ladder system means to put one in somewhere. If something happens accidentally it is not planned or wanted. Reduce means “cause to be less”. Duration means the time taken to do something. The impact means the difference that can be made to something. The 65m ladder will be installed permanently with nails hammed to the karst surface. If ladders are installed permanently, they are put there forever and not just for a while. Karst means landscape on top of limestone. Overseeing means being in charge. To determine something means to work it out and come to an answer for a question. To give the green light means to allow something to go ahead, the same way a green traffic light allows a car to proceed. A controversy is an argument or a debate in which people have very strong feelings about what is being discussed, whether they are for it or against it. Netizens are people who used the Internet. An environmental impact assessment is a study to see how much impact a proposed development will have on a place. To affirm means to tell someone in a way that they should expect to believe you. A maximum of 270 visitors are allowed in the cave in one year and Oxalis has also made strict rules ensuring visitors who get the opportunity to go inside the cave respect nature. An opportunity is a chance. To respect nature means to appreciate its importance. A high stalactite wall in Sơn Đoòng Cave is known as “The Great Wall of China”. Oxalis is the only tour provider for expedition programmes in Sơn Đoòng Cave. Howard Limbert is an expert on caves who has a quarter of a century’s experience in exploring Quảng Bình’s caves, including Sơn Đoòng. The British Cave Research Association explored Sơn Đoòng Cave seven years ago. Sơn Đoòng Cave is the world’s twelfth largest cave.